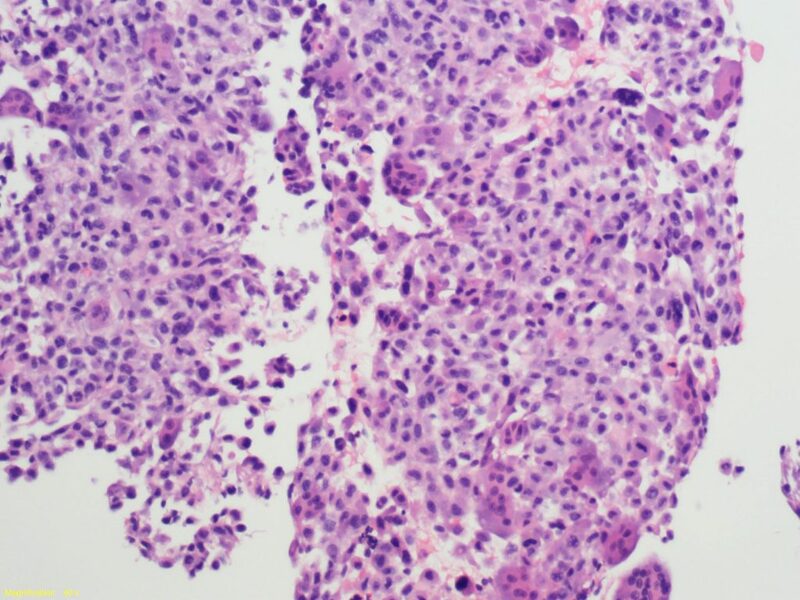 There are a number of cellular components and morphologies present in a pancreatic undifferentiated carcinoma with osteoclast-like giant cells. There are tissue fragments, discohesive groups, and single cells. Cells are very pleomorphic; some large and epithelioid while others are spindled in morphology. There are also numerous histiocyte-like mononuclear cells. Mitotic figures are easily identified. 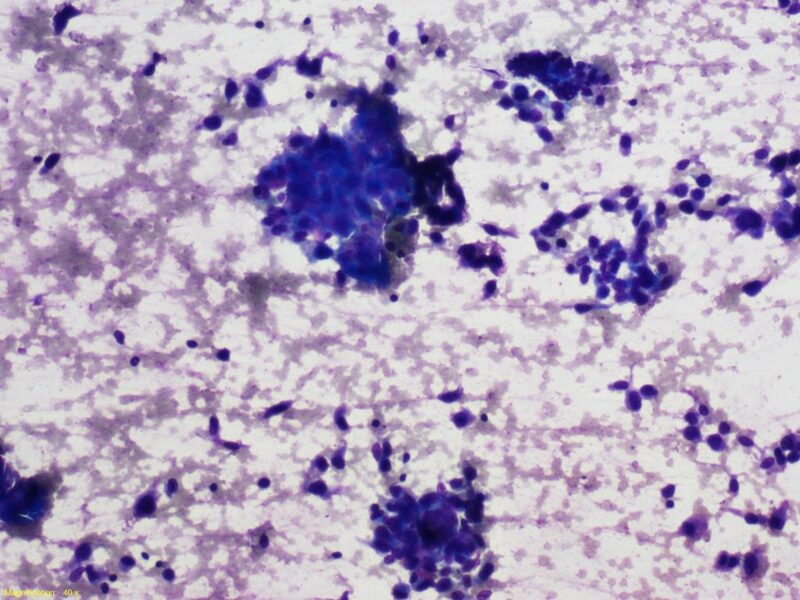 An interesting finding in this lesion is numerous osteoclast-like giant cells. The nuclei of these cells are relatively monomorphic with nucleoli. 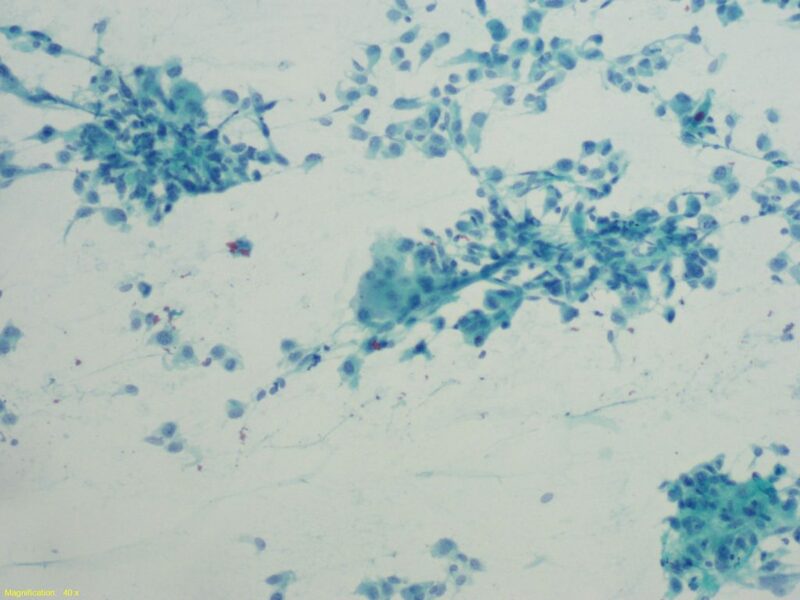 Dependent upon sampling limitations, there may or may not be more recognizable appearing ductal adenocarcinoma cells present. Differential diagnosis: This may be a difficult diagnosis to make depending on the cellular components sampled. Approximately 40% may arise in association with a glandular neoplasm such as a ductal adenocarcinoma.1 In most cases, a diagnosis of a malignancy can be attained, but due to poor differentiation, the differential is between a primary malignancy and a metastasis. Site specific immunostains should be performed as well as correlation with radiologic studies. 1. Bibbo, Marluce, MD and Wilbur, David C., MD. Comprehensive Cytopathology, 4th Edition, Elsevior Sauders, 2015.